Takeaway: Though the carbon capture performance of amine solvents is not in doubt, they are associated with high operating cost penalties such as corrosion of the processing plant's infrastructure. Carbon capture from refinery gases, flue gas and natural gas processing plants has attracted global attention due to the rising concerns of climate change and for economic reasons. The technologies available for carbon capture range from absorption, adsorption, membrane and cryogenic processes. However, carbon capture by absorption using reactive chemicals (known as amine solvents) is the most common technology. This is because amine solvents are able to remove over 90 percent of the carbon dioxide (CO2) in the feed gas. Though the carbon capture performance of amine solvents is not in doubt, they are associated with high operating cost penalties such as corrosion of the processing plant's infrastructure. Corrosion often leads to equipment replacements, plant shutdowns, production losses, personnel injury and leaks that can become environmental concerns. The combination of these will increase financial implications, which are highly undesirable. What are the major sources of corrosion in carbon capture process plants? Corrosion in carbon capture process plants can be triggered by a number of factors such as impurities in the feed including carbon dioxide (CO2), oxygen (O2), fly ash, sulfur compounds and nitrogen oxides in the feed gas, and the type and concentration of the amine solvent. The most common sulfur compounds encountered are carbonyl sulfide (COS), carbon disulfide (CS2), hydrogen sulfide (H2S), sulfur dioxide (SO2) and sulfur trioxide (SO3), while nitrous oxides include nitric oxide (NO) and nitrogen dioxide (NO2). These impurities reduce the performance of the amine solvent by forming degradation products, which are known to cause and aggravate corrosion problems in carbon capture process plants. In some cases, corrosion can be caused by the amine solvent itself. There are different classes of amine solvents and their corrosion tendency usually rank in the order tertiary < secondary < primary. However, it is important to note that their concentration during carbon capture should be monitored because a very high amine concentration can lead to excessive corrosion problems. This is why the popular amine known as monoethanolamine (MEA) is usually used at a maximum 30 wt.% concentration. Where is corrosion most prevalent in carbon capture process plants? Corrosion can occur in various places; however there are some locations that are more susceptible. These include the bottom of the absorber column, the bottom of the stripper column and the reboiler section. These locations are represented by the red lines in Figure 1. Figure 1. Diagram of typical configuration of carbon capture process plant. The bottom of the absorber column is prone to increased corrosion because the concentration of impurities in the feed gas and the CO2 and degradation products in the amine solvent are highest. Together these increase the corrosion rate. The high corrosion tendency at the reboiler section and stripper column bottom is due to a combination of the high operating temperatures and the presence of water and CO2 vapors. As previously stated, the high temperature can thermally degrade the amine solvent thereby forming other types of degradation products that will eventually increase the corrosion rate. What technologies are available to mitigate corrosion in carbon capture process plants? Corrosion mitigation can be achieved by using corrosion resistant material such as 304 and 316 stainless steels. However, this will drastically increase the capital cost of carbon capture plants. In some cases, cheaper carbon steel lined with stainless steel can be used. Other technologies include the use of corrosion inhibitors, degradation inhibitors and selecting the proper amine type and concentration. Degradation inhibitors can also serve as corrosion inhibitors because once the formation of degradation products are reduced the corrosion rate will also decrease. Another corrosion mitigation technology is to apply low heat (maximum 100°C) at the reboiler section. From a chemical reaction standpoint, reducing the temperature by 10°C will reduce the reaction rate by 50 percent. This trend can also be a way to minimize corrosion rates. Are there any challenges associated with some of the corrosion reduction technologies? One of the major issues associated with some corrosion mitigation technologies is maintaining the inhibitor's concentration. Fluctuations in inhibitor concentration can be unforgiving in terms of minimizing corrosion rates. In some cases experience has shown that a drastic change in inhibitor concentration can become counterproductive, hence accelerating corrosion rates. On the other hand, selection of the amine type is done during the design stage so corrosion might not actually come from the type of amine. (Be sure to also read Corrosion Control Considerations in the Equipment Design Process.) 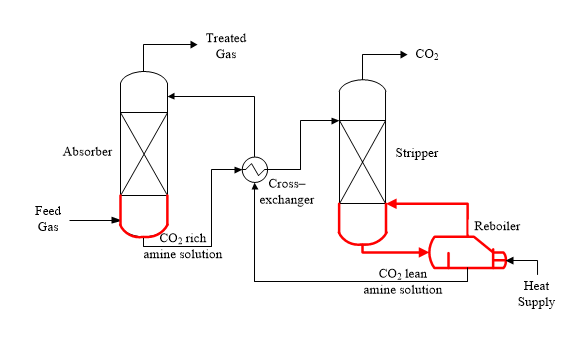 However, the concentration of the amine during carbon capture must be carefully monitored and maintained because some amine solvents are unforgiving when there are fluctuations in its concentration during the carbon capture operation. The biggest challenge with applying low heat at the reboiler section is that the efficiency of the stripping column is reduced, hence reducing the carbon capture performance of the amine solvent. A rule of thumb is to find an optimal stripping temperature that will reduce the corrosion rate without compromising the efficiency of the carbon capture process. Are there any future prospects towards corrosion monitoring and reduction in carbon capture process plants? Some of the technologies for reducing corrosion are closely related. For instance, choosing the right amine type and concentration will most likely reduce degradation rates thereby leading to non-application of inhibitors (degradation and corrosion). In the near future the ideal amine solvent is expected to maintain a high carbon capture efficiency with less degradation, hence reducing corrosion. At the moment there is no real-time technology to accurately monitor the concentrations of the amine solvent and inhibitors. Therefore, industries rely on time consuming and expensive analytical methods for concentration monitoring and control. It is expected that advancements in smart systems (e.g., artificial intelligence) will provide a reliable solution for monitoring degradation rates as well as amine and inhibitor concentrations. Chikezie Nwaoha is a researcher at the Clean Energy Technologies Research Institute (CETRI), University of Regina. He has more than 7 years’ research and development experience in carbon capture and utilization from large industrial sources, gas separation, clean energy technologies and process simulation and optimization. He has published over 10 research articles in international peer review journals and presented papers at international conferences. In 2012, Mr. Nwaoha co-edited the book titled ‘Process Plant Equipment: Operation, Control and Reliability’ which was published by John Wiley and Sons, USA. This was followed by the book titled ‘Corrosion and Materials in the Oil and Gas Industries’ which was published in 2013 by CRC Press (Taylor and Francis Group), USA. He is also a co-author of the books ‘Dictionary of Industrial Terms’ and ‘Dictionary of Oil, Gas and Petrochemical Processing’ which were both published in 2013 by Scrivener Publishing, USA and CRC Press (Taylor and Francis Group), USA respectively. These book projects had over 70 contributors working in all parts of the world – USA, Canada, England, Scotland, Italy, Serbia, Norway, Turkey, Portugal, Nigeria, Egypt, China, Japan, Bangladesh, Malaysia, Jordan, Oman, Singapore, Iraq, Iran, United Arab Emirates, Australia, Brazil and India. Mr. Nwaoha is engineer–in–training (EIT) with Association of Professional Engineers & Geoscientists of Saskatchewan (APEGS). He is also a member of Pulp and Paper Technical Association of Canada (PAPTAC), Gas Processing Association of Canada (GPAC) and Professional Writers Association of Canada (PWAC). The statement made herein is solely the responsibility of the author.